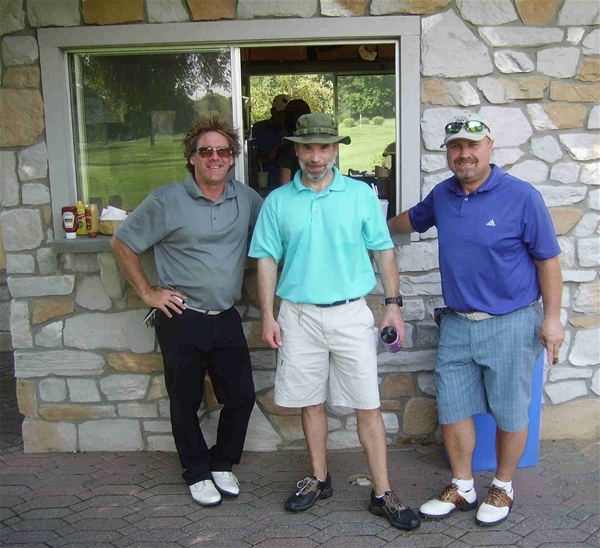 C Flight members Robert Stillman, Zach Davis and Caesar Caramanico enjoy the on-course refreshments at Radley Run CC. Radley Run Country Club in rural West Chester, PA was the tournament venue for the GOLFWEEK Amateur Tour (Philly Metro) tournament on Saturday July 25th, 2015. A field of forty-five tour members competed on a lovely sunny and warm summer afternoon. This fabulous private golf course was designed by Englishman Alfred Tull, and opened in 1964 on the site of the former Brandywine Hunt Club property. The course features sweeping vistas of the surrounding homes, many elevation changes, numerous water hazards, and several brilliant risk-reward holes. This was our fifth year at Radley Run and it has become an annual favorite of many members. In the Championship Flight, Paul Yun (74, 35-39) broke through and won his first GOLFWEEK Amateur Tour event by two strokes over Kyle Mazza (76, 38-38). Yun had 3 birdies during his round. Alex Hargaden (78, 37-41) finished another two-strokes back in 3rd place. CHAMP Flight played Radley Run from “the tips” on BLUE tees at 6,847 yards. The A Flight winner, Tom Smith, also celebrated his first victory on the GOLFWEEK Amateur Tour. Smith went around in 80 (38-42) to secure a four-stroke victory over Tony White (84, 41-43). Smith made 4 birdies during his round. Justin O’Neal (85, 45-40) was another stroke back in 3rd place. The A Flight also played Radley Run from “the tips” on BLUE tees at 6,847 yards. In the B Flight, Jim Boyce took the title with a fine round of 82 (41-41) to post a two-stroke victory over Kevin Martyn (84, 42-42) and Brian Lynch (84, 39-45). Martyn took 2nd place on a match-of-cards. It was Boyce’s 2nd victory this season. The B Flight played from WHITE tees at 6,422 yards. The C Flight went to a one-hole playoff to decide the winner. Dave Neder (89, 43-46) and new member Kirk Forchetti (89, 45-44) were tied after regulation play. Neder took the title with a bogey on the 1st hole. John Son (92, 49-43) was three strokes back in 3rd place. The C Flight also played from the WHITE tees at 6,422 yards. In the D Flight, new member Brett Johnson (94, 45-49) took the title by one-stroke over veteran John Stevens (95, 48-47). The D Flight also played from the WHITE tees at 6,422 yards. Everyone enjoyed the opportunity to play golf on such a pristine and challenging private golf course. Special mention goes to the Head Golf Professional at Radley Run, John Kellogg, and his staff, who provided our group with exemplary service and made the entire experience a most enjoyable one. Our next event is at one of the great private courses in our area, the Brookside Country Club in Pottstown, PA. Scheduled tee times start at 12:00 PM from the 1st tee. The tournament entry fee is $130.00 and scheduled practice rounds are available.